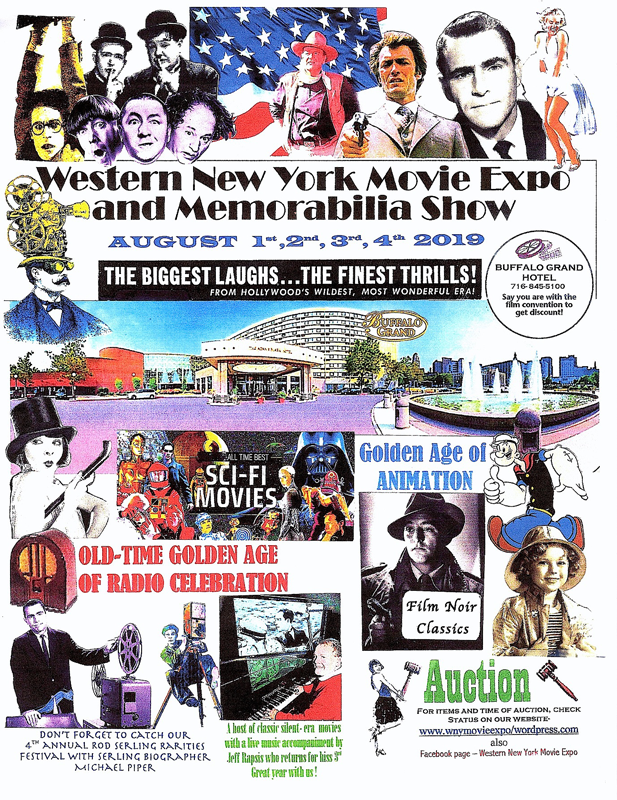 We’ll be back for our fourth year of the annual Western New York Movie Expo here in downtown Buffalo, New York. All you film-watchers can visit this site as well as our Facebook page to get the latest bookings we are making. We’re still working on our schedule for this year’s Expo, but a wide variety of rare movies will be screened – Hollywood’s Golden Era, silent movies with live musical accompaniment by Jeff Rapsis, vintage television, and vintage animation classics. And don’t miss our Movie Memorabilia Emporium! This year, dealers from New York, Boston, Minneapolis, Chicago, and other cities will bring you posters, books, DVDs, movie reels, autographs, cameras, and many other collectibles. Three screening rooms will bring a wider variety of films to the schedule. If you miss a scheduled movie, we will re-run it in one of the three screening rooms for you. This is a film festival for movie fans of all ages – and seeing movies with an audience is always more fun! So is making new friends and catching up with “old comrades in collecting”. Please click on the poster for a larger image. To get the latest updates, please join our eMail list or “Like” us on Facebook. The hotel is located on Church Street, across from City Hall and the Channel 7 television station – and conveniently off the expressway exit in downtown Buffalo, New York. More information on our venue is available on the Hotel page. Planning to attend all four days? Get the “Weekend Package” and save! Daily admission tickets are also available. Students, show your valid ID and save $2 on daily admission tickets on Friday, Saturday, and Sunday. More information about tickets is available on the Tickets page. Doors to the Movie Expo open at 9 am each day. Parking is available at the Buffalo Grand Hotel in a two-deck parking garage adjoining the hotel. Pick up a ticket at the gate on entering the parking area. Please validate your ticket at the hotel’s front desk. A daily fee of $10 will be charged to registered hotel guests, who will also have in-and-out privileges. Movie Expo attendees not staying at the Buffalo Grand Hotel may also park in the garage for the $10 daily fee, including in-and-out privileges. The lot is self-parking only. Valet parking is not available. Doors open at 9 am each day. Want to find out about the latest Expo news? Join our eMail list! Just enter your eMail address below, and you'll be notified by eMail when this website is updated with information on the Expo. On Saturday, Aug. 26, 2017, Alex joined Morgan White, Jr. on Boston's WBZ radio, 1030 AM, for The Morgan Show at 10 pm.